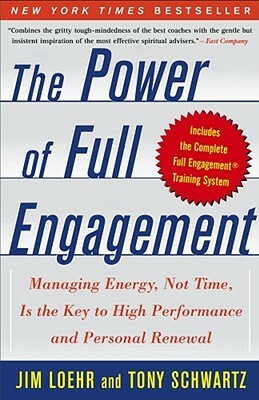 Dr. Jim Loehr is Chairman, CEO, and Co-founder of the Human Performance Institute, a training company that has successfully utilized energy management technology to improve the productivity and engagement levels of elite performers from the world of business, sport, medicine, and law enforcement for over 30 years. A world-renowned performance psychologist, Dr. Loehr is the author of thirteen books including the national bestseller The Power of Full Engagement. Dr. Loehr appeared on The Oprah Winfrey Show where an entire program was devoted to his ground-breaking Energy Management training system and concepts. He has also appeared on NBC's Today Show, ABC's Nightline with Ted Koppel, The CBS Evening News with Dan Rather and CBS Morning News. Dr. Loehr's work has been chronicled in leading national publications including the Harvard Business Review, Fortune, Newsweek, Time, US News and World Report, Success, Fast Company and Omni. Dr. Loehr has worked with hundreds of world-class performers from the arenas of sport, business, medicine and law enforcement including Fortune 100 executives, FBI, Hostage Rescue Teams and Army Special Forces. His elite clients from the world of sport include: golfer Mark O'Meara; tennis players, Jim Courier, Monica Seles, and Arantxa Sanchez-Vicario; boxer Ray Mancini; hockey players Eric Lindros and Mike Richter; and Olympic gold medal speed skater Dan Jansen. Dr. Loehr possesses a masters and doctorate in psychology, serves on several prestigious scientific boards and is a full member of the American Psychological Association, the American College of Sports Medicine, the National Strength and Conditioning Association, and the Association for the Advancement of Applied Sport Psychology. Tony Schwartz is the founder and president of The Energy Project, a consulting group that works with a number of Fortune 500 companies, including American Express, Credit Suisse, Ford, General Motors, Gillette, Master Card, and Sony. He was a reporter for the New York Times, an associate editor at Newsweek, and a staff writer for New York Magazine and Esquire and a columnist for Fast Company. He co-authored the #1 worldwide bestseller The Art of the Deal with Donald Trump, and after that wrote What Really Matters. He co-authored the #1 New York Times bestseller The Power of Full Engagement with Jim Loehr. Fast Company Combines the gritty tough-mindedness of the best coaches with the gentle but insistent inspiration of the most effective spiritual advisers. Stephen R. Covey, author of The 7 Habits of Highly Effective People A remarkable application of the athletic metaphor to high-performing people and organizations.